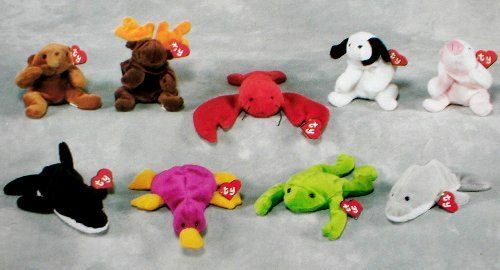 The Original 9 Beanie Babies are Cubbie, Chocolate, Pinchers, Spot (without a spot), Squealer, Splash, Patti (Raspberry), Legs and Flash! To understand about Beanie Babies BROWNIE, PUNCHERS, PATTI BEANIES, AND ORIGINAL 9 BEANIES, you have to go back in time to 1993 when it all began. Here are questions that have come up over the years, together with their answers. Q: Which was the first beanie baby ever made? A: There were 2: Brownie and (Deep Fuchsia) Patti. Both were introduced in November 1993 at the Gatlinburg Show, a toy exposition, in Tennessee. Q. Patti is referred to by 4 colors, and there seems to be confusion between them. A. The number of beanies produced was smaller than they are now. Each time a new Patti was produced, the dye lot changed slightly. The 1st Patti’s color is referred to as Deep Fuchsia Patti. It can only have a 1G hang tag and 1G 4-line Korea tush tag. It was only produced for a very short period in 1993. The 2nd Patti’s color was Raspberry*, but sometimes is referred to as Maroon, and can have a 1G or 2G hang tag, and a 1G tush tag. This is the color that was part of the Original 9 beanies. It was produced and sold in 1994. Not that I want to confuse anyone more, but it is said that the Patti Raspberry with Korea on the tush tag, has a deeper plush and is slightly more burgundy color than Patti Raspberry with China on the tush tag. The 3rd Patti’s color is Magenta*, but sometimes is referred to as Maroon, also. It has a 3G hang tag, and 1G tush tag. This was produced and sold in 1995. The 4th Patti’s color is referred to as Fuchsia, and can come with a 3G, 4G, or 5G hang tag. This was produced in 1996 and retired May 1st, 1998. This is the most common Patti. * Raspberry and Magenta colors are both variations of a Maroon color, and both are referred to as Maroon sometimes. To determine which Patti you have, follow the hang tag and tush tag generations. Q. Many times I’ve seen mention that the first 2 beanies were Brownie and Punchers, not Brownie and Deep Fuchsia Patti, why is that? It could be because both those beanies had 2 names, so they were talked about a lot so those are what people remember. With Patti being produced in 4G of hang tags, people often think of it as a later release, and have forgotten about the very 1st Deep Fuchsia one produced in 1993. Q. Brownie had a name change to Cubbie, why? A. Only Ty would know the answer for sure, but it is thought that perhaps another company already had copyrights to the name Brownie. Q. Punchers had a name change to Pinchers, right? A. No. Punchers was not a name change, it was a misspelling/typo on the hang tag. On the very first Pinchers’ 1G hang tags, the name was Pinchers, then when more were produced, in 1G too, it was misspelled Punchers, but was corrected quickly. Q. Why weren’t Brownie and Patti (Deep Fuchsia) part of the original 9 beanies, since they were the first produced? A. Ty had established accounts for his Ty Plush and Attic Treasure lines. For the Gatlinburg Show, he had produced these 2 beanies and made them available for sale there. Also, at the show, he had the “Original 9” beanies on view. There were no names on these beanies; they had no hang tags on them. However, orders could be placed for them. Q. When was the official introduction of the Original 9 beanies? A. The official issue date of the beanies was January 8th, 1994. They were in the January 1994 Ty Retailer’s catalogue, and on the order forms, but not on the German order forms. They were available for all to see and order at the larger New York World Toy Fair in February, 1994, but preferred customers and those fortunate to have seen them earlier at the Gatlinburg show, received their orders before the February Toy Fair. Q. How can you tell if you have an original Original 9 Beanie? A. The hang tag will be 1st generation, and a ‘true’ original 9 beanie will have a 4 line Korean tush tag. Q. So when people say they have an Original 9 Beanies, more often than not they are referring to same style as an Original 9 beanie, one produced at a later date, rather than the original Original 9? Q. Was Spot (with a Spot) an Original 9 beanie? A. Spot was an Original 9 beanie, but strictly speaking, the Original 9 Spot had no spot, and was 1G. The first Spot, with a spot, came with 2G hang tag.